Have you heard? Milling at home can be less expensive and healthier than buying pre-ground flours! Much of the flour that is sold in grocery stores has been stripped of its nutrients and has extra ingredients and preservatives added to prolong shelf life. Not only that, but some flours, like almond and coconut, can run as high as $15 per bag! There has to be a better way. There is with The Homemade Flour Cookbook. 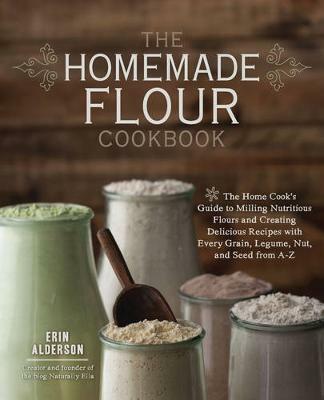 Erin Alderson will explore the different ways to grind flour including electric and non-electric grinders, food processors, blenders, and even coffee grinders, making it easy for any do-it-yourself homemaker to have fresh flour whenever needed. Try out great grain recipes like Cheddar Rosemary Farro Scones, Zucchini Feta Empanadas, Einkorn Biscuit Cinnamon Rolls, and Black Pepper Pasta with Goat Cheese and Pesto. There are also dozens of Gluten-Free recipes. Check out Butternut Squash and Goat Cheese Lasagna, Cheddar jalapeno quesadillas with quinoa tortillas, Berry Crisp with Oat Dumplings, or Buckwheat Dutch Baby with Maple Cherries! There are even recipes for legume, nut, or seed flours. Flatbread with sun-dried tomato dip, Feta and Curried Red Lentil Dip, Coconut Pancakes with Citrus Compote, Honey Sunflower Biscuits with Jam and Dark Chocolate Dipped Almond Meal Biscotti are just a few of the recipes that you'll make with your own hand-milled flour!